Artha Forum (the non-profit initiative for bringing ancient wisdom to modern business) held its third event in Bangalore on Friday 18th March 2016 at the Taj Vivanta Hotel, M.G. Road. The event was attended by over 100 invited guests, including many members of the event partner, the Indo-American Chamber of Commerce – Karnataka Chapter. The keynote speaker was His Holiness Bhakti Charu Swami, a Gaudiya Vaishnava sannyasi and renowned Vedic scholar and spiritual master. The evening’s proceedings began with an introduction by Sanjiv Maheshwari, Co-Founder and Director, Artha Forum. Sanjiv spoke about the increasing inequality in the world today, and the necessity for creating awareness amongst entrepreneurs to do business in a more socially and spiritually responsible way. Sanjiv further mentioned that Vedic philosophy, which is a guide to humanity for purposeful living, instructs that one should earn with integrity and spend with compassion. Sanjiv added that Artha Forum has held dozens of events at key global locations, and the impact is being seen in entrepreneurs and corporate leaders successfully incorporating this philosophy into their business practices. The panel discussion included Madan Padaki, Co-Founder and CEO, Head Held High; Sanjay Dhawan, Partner, PwC; Srinivasan PV, former Senior Vice President, Corporate Taxation, Wipro; and Vishal Gupta, Managing Director, Bessemer Venture Partners. The panel was moderated by Artha Forum’s Bangalore coordinator Sanjay Sharma, Director – Asia Operations, Microsoft. Mr Padaki explained that a business enterprise with good consciousness or intent is generally successful, whereas one whose only agenda is to make money will eventually fail. Mr Dhawan explained that the soul of a business is not profit but rather purpose and every entrepreneur and employee should consider how to bridge the gap between the haves and have-nots and how to society can be improved. Mr Srinivasan explained that conscious entrepreneurship must exert responsible capital, instil responsible consumerism and spread spiritual thoughts. Mr Gupta explained that most high quality businesses start with an intent to solve a particular problem or social issue, and a conscious entrepreneur will continue to take care of all stakeholders; the real challenge for businesses is not about whether their intent is proper but rather about how to spend money responsibly. Then followed the keynote speech by His Holiness Bhakti Charu Swami. 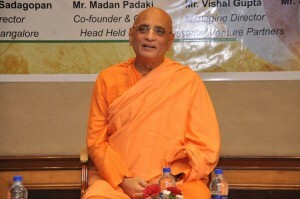 Maharaj gave an intriguing explanation of the Vedic injunction for entrepreneurship and business, explaining that entrepreneurs should work for the benefit of others, and focus on deriving happiness and satisfaction – then money will naturally follow. Vedic wisdom offers specific instructions on how to achieve that by gradually elevating one’s consciousness through the stages of philosophy until one reaches the perfection of yoga: bhakti, or developing a loving relationship with the Supreme. Maharaj further explained that by adjusting one’s consciousness in this way one will achieve superior results in material life – if we act properly, we get the right results. A lively questions and answers session witnessed Maharaj and the panellists respond to challenging questions on the topic. The speakers were each presented with gifts of The Journey Home, the intriguing autobiography of His Holiness Radhanath Swami (the inspiration behind Artha Forum, and spiritual god-brother of His Holiness Bhakti Charu Swami) and stunning Odissi-style paintings of Radha-Krishna and the Gopis on silk scrolls. Finally, Mahatma Das, Brajamohan Das and Atma Krishna, who are professional executive coaches and also Artha Forum volunteers, introduced their seminar on enlightened leadership and entrepreneurship. The seminar will help business leaders and employees to do business in a more conscious way and provide practical tools and strategies to dramatically improve performance. The evening’s programme ended with a delicious vegetarian banquet dinner, and each attendee departed with a gift of the Bhagavad Gita As It Is.